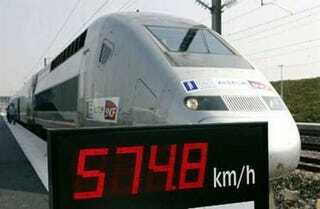 A souped-up TGV (Train a Grande Vitesse) broke the train speed record today, speeding along at a whopping 357.2mph. Loaded up with two supercharged locomotives and oversized wheels, it broke the record on a specially prepared track east of Paris. Apparently Governator Arnold sent a delegation to check the train out, pondering the feasibility of bringing the speedy train to California. According to our West Coast contingent (i.e. Blam and Chen), however, the chances of that actually happening are slim to none. Sorry, Californians.